Eagle Scout raise an additional $300 using DonationTo Paid accounts! Using a donation website to crowdfund has become increasingly popular over the past few years, and DonationTo has a proven history of helping people hit their goal. Therefore, a wide variety of different crowdfunding projects have been hosted on our platform. For example, online Eagle Scout fundraising has helped several people raise money to complete their Eagle Scout projects. These projects are always beneficial to the local community, and utilizing a donation website makes it much easier for supporters to get involved. DonationTo will provide you with several fundraising tips and a social networking integration tool to make it easier to host a successful campaign. Additionally, you will not need any special technical skills in order to build your page. We are also committed to helping you collect as much money as possible. Therefore, we enable each of our users to avoid paying for any extra credit card fees, and we will let you keep 100 percent of the money that you raise. When you consider how expensive an Eagle Scout project can be, you will easily be able to understand why so many people turn to our cost-effective platform for a wide variety of crowdfunding needs. A prime example of the power of Eagle Scout fundraising is the recent successful campaign that was launched by Shane. 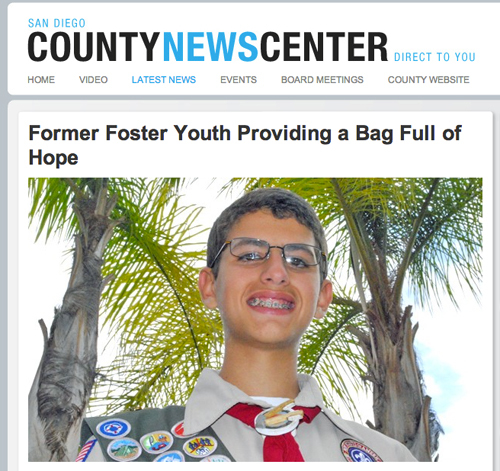 This young boy from San Diego decided to use his project to make a difference in the world of foster children. Shane’s fundraising page discloses the fact that he was in foster care system until he was adopted at the age of nine, and this made him want to provide support for other children who have not yet found a permanent home. To make Shane’s goal come to life, he used DonationTo as a resource for collecting online donations. Fortunately, taking this approach made it very easy for people around the world to make a contribution, and Shane quickly exceeded his goal of $7,500. As an added bonus, using DonationTo enabled Shane to save more than $400 in fees. Now that Shane has raised enough money, he will be purchasing and donating 100 high quality duffel bags, stuffed animals and flashlights to provide foster children with a sense of security during each of their moves. After all, most children in the foster care system end up toting their meager possessions around in a trash bag, and Shane wanted to put an end to this for at least 100 people. Shane had already raised $6,500 by the time the San Diego County News Center picked up his story, but this media attention almost certainly helped him cross the finish line. According to the article, the 13-year-old is four years younger than the average Eagle Scout, and this is a testament to how well he has been thriving since he was adopted. However, Shane’s determination to make his duffel bag goal into his project was almost rejected by Boy Scout officials because it did not meet their traditional guidelines for an Eagle Scout project. Fortunately, after approximately 15 hours of working on his presentation, Shane was able to convince the appropriate officials that his project idea was a good representation of everything that a Scout Project is supposed to be. The San Diego County News Center also reported that Shane is hoping to keep his fundraiser moving forward on a continual basis. As of right now, he is still accepting online donations for several more weeks, and any extra money that he raises will be used to purchase supplies for additional foster care children. 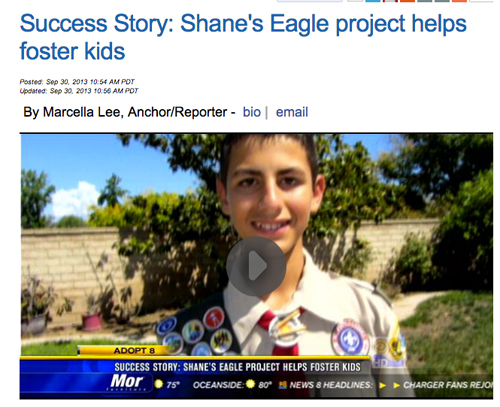 Shane’s local CBS station interviewed the young boy about his ambitious Eagle Scout project, and they published the story on their website on September 30, 2013. This level of media attention is always desirable during a fundraising project because it will help you spread the word about your efforts to a much wider audience. Shane told the local CBS affiliate that he selected each of the items within the duffel bags based on his personal experiences in the foster care system. For example, he stated that he did not have a stuffed animal to hug for comfort when something scared him. Instead, he would end up having nightmares, and Shane hopes that at least 100 children will now have the necessary security to avoid bad dreams. Although Shane was adopted at the age of nine, he moved in to his new home when he was seven. This means that he only spent three years in the active foster care system, but it made a huge impression on him, and Shane has indicated that it also had a negative impact on his self-esteem. In fact, Shane told CBS that having his items delivered to him in a trash bag made him feel like all of his stuff was worthless. Fortunately, 100 children will no longer need to feel this way once they receive their new duffel bags. Making the decision to crowdfund online for an Eagle Scout project is definitely one of the best ways to ensure that you will hit your goal. For example, Shane turned to DonationTo when he began working on his Eagle Scout fundraising campaign, and he was able to raise more than $7,500 in less than two months- because he was using a DonationTo paid account he was able to save over $300! This highlights the importance of accepting online donations, and it also showcases how vital media attention can be when you are attempting to raise a large amount of money. By using DonationTo, Shane was able to avoid paying for any additional credit card processing fees, and we also made it easy for him to keep every penny that was donated. In fact, Shane saved more than $300 by using one of our paid accounts, and this helped him hit his goal much faster. Now that the goal has been met, Shane is in the process of putting together the physical components of his donation to local area foster children, and he hopes to raise enough money to help several more people.